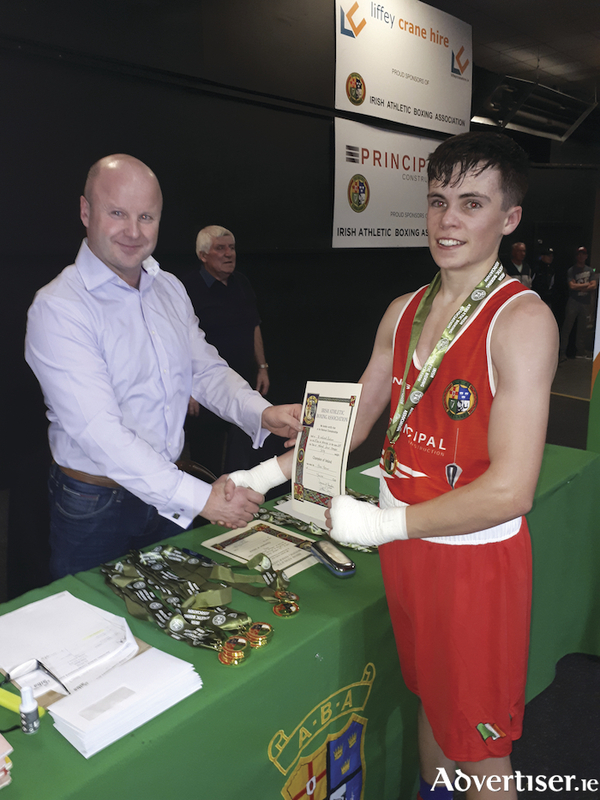 Monivea BC boxer Adam Hession made history at the weekend when he became the first male boxer to win a national senior title for the club. Flyweight Hession boxed eight times national champion, Terry Donoghue, (St Michael's, Athy ) in the decider and the Monivea man was in control of the contest from the moment he stepped into the ring, putting Donoghue under pressure, hitting the target with straight lefts and rights and great combinations. Hession kept up the pressure in the second round with great footwork, changing angles, and making it very difficult for Donoghue to pin him down. Hession continued to dominate in the third round and won the contest on a score of 5/0, to rousing cheers from all his supporters. He will box in the Under 22 National Championships in January and in the National Elite Championships in February.